Juliana Spano is a sophomore majoring in rhetorical studies and minoring in international affairs and fine arts. She took advantage of Hofstra’s location by taking a course held in New York City during January session, which provides students with an exciting opportunity to study abroad or take courses held outside the typical classroom. Let's hear from Juliana! Greece's Permanent Mission to the United Nations. This winter break I experienced the coolest opportunity of my life while taking a Hofstra course called Field Study to the United Nations. Each day, I hopped on the train straight to the city to take this course. As a political communications major and international affairs minor, the ability to speak to diplomats at the UN was an incredible opportunity. Not only did we go to the UN, we also traveled around the city to visit non-governmental organizations such as Amnesty International, and Permanent Missions to the UN. This opened my eyes to potential employers, as well taught me the different perspectives of countries in world politics. 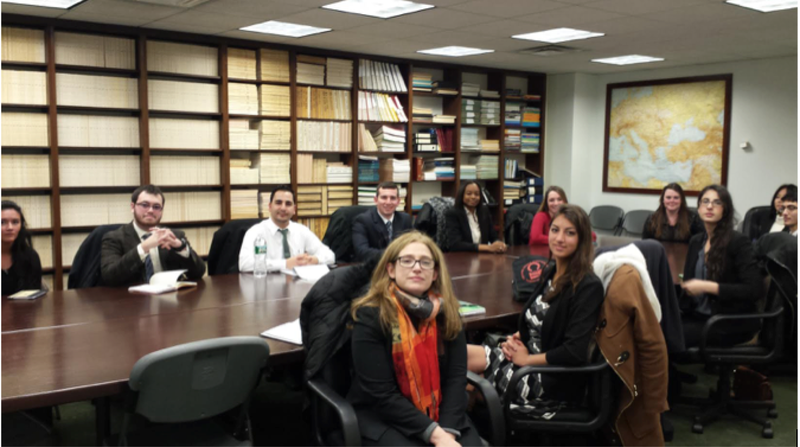 The first week we took a tour of the United Nations and then traveled to the European Delegation to the UN. Here, the EU representative lectured us on the status of the UN. Other country missions we visited included South Africa, Greece, Japan, and the United States. I also learned how to navigate the city! I had to take so many different subways to reach my destinations. I also learned where to find the best coffee and pizza around Manhattan! The whole experience really opened my eyes to world politics, and solidified my ambition to continue studying international affairs.